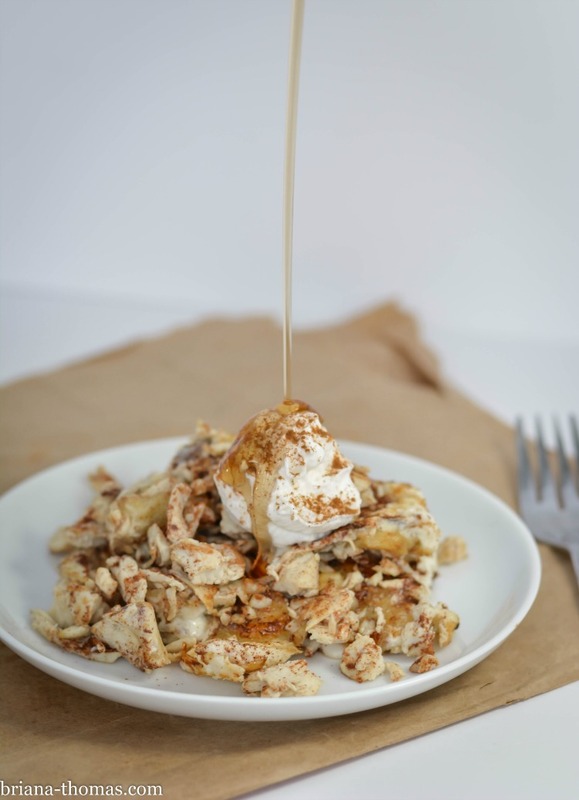 In the spirit of branching out for breakfast (check out the PB&J Breakfast Crumble I posted the other day), here’s another not-so-typical option: a sweet and savory banana scramble with plenty of protein in the form of chicken breast and egg whites. Normal? Not so much. Yum? Totally. I completely understand that you might think the idea of bananas and chicken and stuff for breakfast is absolutely disgusting, but please don’t knock it till you’ve tried it. The flavors combine exceptionally well, especially with the addition of some cinnamon. Some sugar-free maple syrup is really good on top, as well. This dish really does taste better than it looks. I didn’t have the foggiest notion how to get it to look like something half presentable, so I gave up in favor of speed and efficiency so I could eat my breakfast before it got totally cold. 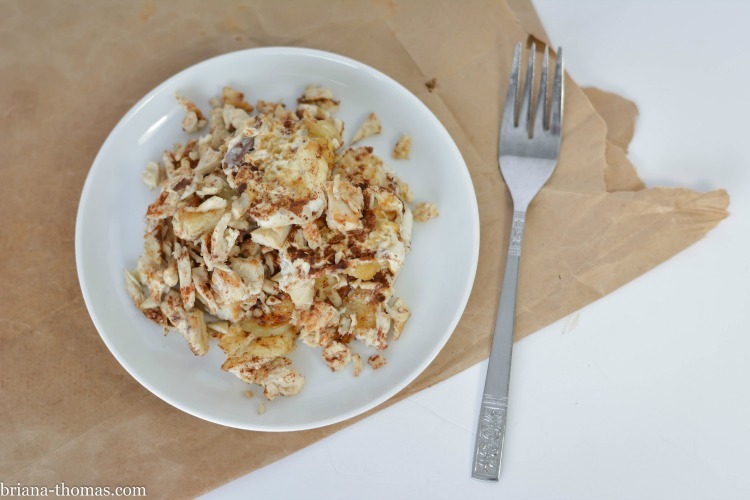 This breakfast scramble is super easy and is a good way to use up leftovers that might be accumulating in your fridge and on your countertops. I.e. half-eaten bananas (we Trim Healthy Mamas tend to have a lot of half-bananas sitting around…), bits of leftover chicken breast, egg whites left over from making pudding, etc. Like my Facebook page to keep up with my recipes as well as other tidbits I post! Saute the banana in the oil in a small saucepan. Pour in beaten or carton egg whites to the thickness of an omelette. Sprinkle with salt and cinnamon to taste. Flip the egg white mixture and add the chicken on top to heat. Scramble together if desired. Serve with a small squirt of fat-free Reddi-Whip and a drizzle of sugar-free, maple-flavored syrup if desired.